Personas are fictional representations of segments of your buyers. This allows you to understand who they are, what they are trying to accomplish and what influences their buying decisions. For a detailed description of what personas are and how they can help you, listen to Episode 3 or read the blog, Personas: The Great Brand Unifier. Personas are usually separated as B2B or B2C. Download our free B2B or B2C template as a reference. Personas create a shared vocabulary in the organization and targets your media and content. Institutional knowledge – sales & customer service teams, or anyone who interacts with customers. Social media profiles – LinkedIn is one of the strongest tools to use for B2B persona research. Twitter is effective for both B2B and B2C. Facebook has a greater B2C focus. Trade publications & business media – Harvard Business Review, Fortune, Inc., etc. articles related to the persona’s pain points, aspirations, “day in the life,” frustrations and trending topics. Web & social analytics – dig dipper into Google Analytics and Facebook analytics to learn more about your segmented audiences. Social communities – places like Quora and Reddit help you search or pose questions to get first-hand feedback from your target. Social listening – tools that help aggregate information across social networks. For reference, check out the Marketing Smarts podcast on social listening. Secondary Research – reference studies, reports and databases put out by government industries, commercial groups, agencies etc. These reports provide first-hand research and require no investment. Primary Research – if secondary research is not available, invest in a survey or study. Conduct preliminary research before meeting with internal teams to make sure you have enough information to facilitate that group conversation. Have discovery meeting with internal teams to discuss personas. 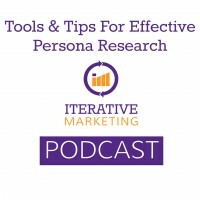 With buy-in from internal teams, begin thorough persona research with tools. Once research is done, do analysis of your research to recognize patterns and identify if any personas need to be split into two. Create draft persona with a name and picture. Call internal teams together to refine the draft. Make any tweaks from refinement meeting and publish and share final persona – but keep in mind it’s a living document. The more you use it, the more you may find out it’s wrong. Have process in place to continuously improve the persona.